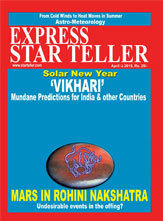 The unique feature of Indian System of astrological prediction is its quality of precision in revealing the periodic ups and downs in the course of an individuals life. The natal chart shows the potential. The order of events is described under Dasa and Mahadasa system. 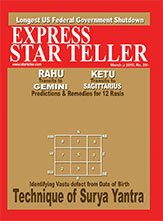 It is only on the basis of this system that the astrologer can indicate whether the inherent potential of any planet can actually fructify during the course of anyone's life.The ancient seers have indicated various planetary orders which bring different planets in prominence at different periods during the course of ones life. But they have not given the clues or the rationale for this order. They have assigned the course of these planets to be completed within certain number of years and within this total they have given different years of ruler ship to planets all of which are not equal. The reason of the total number of years of the cyclic duration, the sequence of planetary rulerships as well as the periods of their rulership is still a well guarded secret which is not known. Nonetheless, these Dasa systems work remarkably precisely and no astrological predictions is meaningful unless the same is synchronised with such a system.